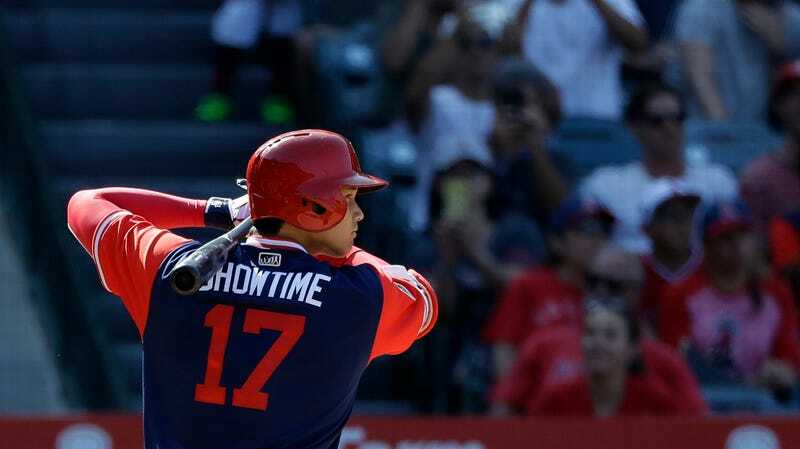 What’s often felt like an inconsistent and tumultuous season for rookie phenom Shohei Ohtani is shaping up to be a pretty damn impressive opening number. So much of Ohtani’s buzz quieted down when a ligament injury pulled him off the mound for most of the season, but while he’s been rehabbing in an attempt to pitch again before the year is done (he thinks he will), he’s remained remarkably consistent at the plate. In 138 first-half at-bats, Ohtani hit .283/.365/.522 to go along with seven home runs, 10 doubles, and an OPS+ of 143. In 94 second-half at-bats, Ohtani has hit .266/.337/.585 with eight dingers and six doubles, while his OPS+ has held true at 145. Barring a final month of the season in which he completely falls apart, what we’ve got is a pretty solid picture of what kind of hitter Ohtani is: a real goddamn professional one. There are all sorts of granular statistics you can look at in order to prove this thesis. His HR/FB rate, hard-hit rate, and line-drive rate all put him in the company of accomplished sluggers like Aaron Judge, Giancarlo Stanton, and J.D. Martinez. But you really only need to see Ohtani in action a few times to understand that he’s going to be hitting homers off major-league pitching for years to come. All those dots between the 387 and 400 are the story of Ohtani’s campaign. They tell us that, even as a 23-year-old rookie, he’s the kind of player who is not going to be overpowered by MLB pitching. They tell us that his swing is special, and allows him to put the ball in places a lot of guys can’t. They tell us that no matter what happens to his pitching career, he’s going to be here for a long time.